I believe it is a gift of love to connect a person struggling with anxiety or depression with an emotional support animal, ( ESA ). When I was in graduate school in 2010 , one of my term papers focused on forming a non-profit to serve a population in need of mental health services. I chose therapy animals helping children with autism. As a licensed psychotherapist I advocate for those struggling with mental illness and through the years I have been involved in various charities supporting animals. I was raised with pets and I continue to have pets to take care of, but truthfully as much as I love on them, they give me so much unconditional love, I would not feel as happy in my life without them. According to an article written in Anxiety.org many Americans with a registered Emotional Support Animal (ESA), the difference between manageable and unmanageable anxiety could be as simple as owning a pet. These animals provide support for emotional disorders including anxiety, depression, post-traumatic stress disorder, and much more by simply being present when their owner becomes emotionally distressed. This aid has helped thousands of Americans overcome their anxieties and stressors by providing a helping hand through stressful situations. But what exactly is an Emotional Support Animal, and does your pet qualify. A study in 1991 found that dogs helped regulate autonomic stress in women. In 2001, a study showed that pet owners had lower heart rates and blood pressure levels and reacted better to psychological and physical stress and recovered quicker from those stresses. Mr. Anthony Watt from Health Line reported the following studies : Interacting with an animal—whether playing with it, caring for it, or simply petting it—is believed to have several positive effects on a person, from creating a sense of calm to providing a sense of purpose. Any animal may be used, but common therapy animals include cats, dogs, horses, birds, and rabbits. Studies have shown that petting an animal can cause a depression patient’s brain to release chemicals called endorphins. These chemicals are designed to counteract the body’s reaction to pain by causing a sense of pleasure or well-being. 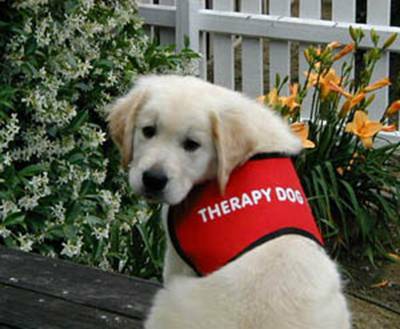 The Delta Society, an organization that supports the use of therapy animals, describes two kinds of therapeutic interactions that can be conducted with animals: animal-assisted activities and animal-assisted therapies. The difference is in the structure of the interaction. Activity sessions usually involve meet-and-greets with a number of patients and animals. The meetings are unstructured and free from detailed goals. Therapy sessions are more formal and usually include set therapeutic goals for the patients. Though animal-assisted therapy does not yet have much clinical evidence backing its usefulness, a large body of anecdotal evidence supports it. Cons of Animal-Assisted Therapy: The risks of animal-assisted therapy are the same as those of handling or being around animals. This includes the potential for allergic reaction or attack. The animals and their handlers should both be trained for activity/therapy scenarios. Animal therapy can have profound effects. When clients soothe animals they are interacting with, they often find that they themselves feel calmer, more peaceful and also soothed.